I like my coleslaw sweet and tangy, but not too sweet. I've seen coleslaw dressing recipes that call for three or four times more sugar than my modest 2 tablespoons. 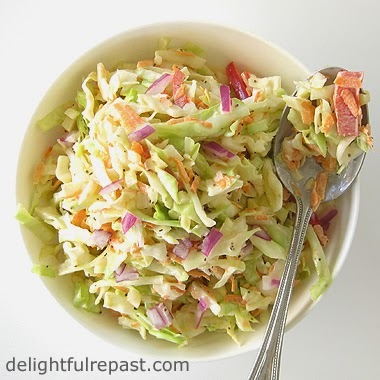 Coleslaw is one of my favorite salads because it is made ahead. Having a 4-quart bowl of it in the fridge makes me feel like I've got lunch and dinner covered for three days! If you like a coleslaw with thick dressing clinging to the vegetables, go ahead and salt, rinse and dry your cabbage beforehand. But I happen to like the juice gradually coming out of the cabbage and thinning the dressing a bit. That way the coleslaw marinates in it, but then when you toss and serve the finished product, the dressing all but drains away leaving only the flavor behind. Slicing, or shredding if you prefer, a whole cabbage is ever so much better than using the packets of coleslaw mix you can buy. That pre-shredded cabbage is always so dry, at least any time I've tried it. The cabbage you cut yourself is so much fresher and juicier. 1 Remove any ragged outer leaves of cabbage. Cut in half, then cut each half into 4 wedges. Trim the core from each wedge and slice it crosswise. Wash and dry in salad spinner. Empty into 4-quart bowl. Add carrots, fennel, red bell pepper and red onion to bowl. 2 In small bowl or 2-cup glass measure, whisk together dressing ingredients. Add to salad and mix well. Cover and refrigerate for 2 to 6 hours or up to 3 days. Toss and serve. Mildly sweet and tangy..that's exactly how I love my coleslaw too. Thanks, Angie. Of course, I consider you the Salad Queen! I love coleslaw as well. Going to be making some on Saturday to go with our ham lunch. Oh yes, Gill, I love it with ham! Thanks, Jo! Glad you noticed that! This looks yummy, and I'll definitely have to give it a try! I doubt you'd like my standard cole slaw recipe, lol. Jacqueline, thanks! Hope you'll try it soon. I love coleslaw Jean! It's so perfect for pulled pork and picnics. I love the crunchiness and I'm with you - I like it sweet! Thanks, Kristi. Yes, I love it for picnics! Nicole, let me know how it turns out for you. What's so great about it for summer cookouts is you can make it way ahead, dressing and all, and it will be crispy and wonderful. Jean, love coleslaw, and especially creamy rather than vinegary. Have a great weekend. Amy, thank you. And Happy Spring! Thanks, Linda. Another vote for creamy! Hope you have a great weekend, too. Jean, just looking at this is getting me in the mood for a BBQ. I'm so ready to open up the pool and get outside. Of course it is still too cold for that, but it's coming soon! This recipe is just perfect for that. It looks delicious! Sending some foodie love your way! Your coleslaw is just the way I like it - creamy but not too sweet. Coleslaw is a MUST with pulled pork. And where I come from you put it on top of the pork - so good! Thanks, Michelle! I'd love to be splashing in a pool, smelling something wonderful on the grill right now! Priscilla, thank you! And yes indeed, plop that coleslaw right on top of the pulled pork, please! Your coleslaw recipe sounds delicious, Jean! Love the addition of the fennel! Pinned and will tweet. Thank you for sharing with us at the Hearth and Soul hop. Thank you so much, April! Much appreciated. Glad you noticed the fennel! 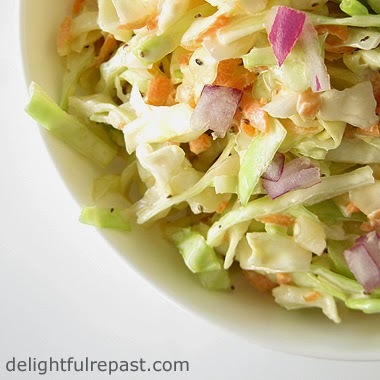 A great recipe for coleslaw - I'm one of the people who sure don't like too much mayo with my slaw. I see that you're using celery seeds which I also like a lot - one thing I've used in the past and which seems to work really well too is celery salt. Might be worth a try? Thanks, Mike! Good to hear from you and have you back in the blogosphere! I love creamy coleslaw on a pulled pork sandwich. I had it the first time in Knoxville and thought, "Coleslaw on top?" I've never had one without it since! Jean, I'm so right there with you on the 'not too sweet' camp for slaw. We use it for the same dishes you do. 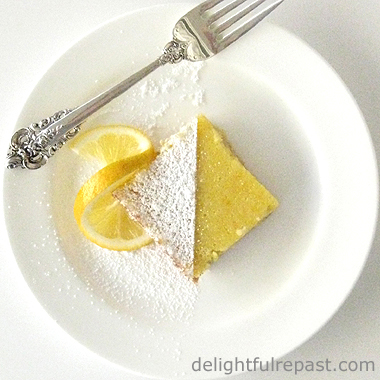 But I'm intrigued by the addition of fennel in yours―something I'm inspired to try! Thank you, Brooks. I was just looking for my usual coleslaw ingredients when I spotted the produce man trimming and shelving fennel, and I thought "Why not try it in the coleslaw?" I liked it. It was more subtle than I expected. Jean, your coleslaw looks like a work of art!!!! Have you thought of taking up painting? Last year Marilyn and I had a lot of building work done on our house. We extended the back of the house and made the the whole kitchen dining area open plan. We chose one colour scheme. Everything is white just like the white cube of an art gallery.We are getting friends, who are artists, to contribute a painting to hang in this space. Pat, an art teacher friend has already given us a wonderful watercolour of some hyacinths. If you were to create a circular painting of your coleslaw I would buy it. What Marilyn and I do is decide what we think the art work is worth financially and then put that amount of cash into an unmarked envelope. When we get the painting from a friend we hand them the envelope.It works well!!! What do you think? The only prerequisite is that it must be large. We have a lot of white wall space to cover!!!! Tony, thank you. And what a great idea for decorating your kitchen! I would love to take up painting one day, but for now I'm too busy cooking! If I were in England, though, I'd take a stab at coming up with a piece of art for your kitchen. Thanks, Diane! Sounds good to me! Oh my, Jean! This dressing is delicious! I made it today to have with Baby Back Ribs tomorrow! Can hardly wait! Dear Lily, thank you so much! I'm so glad you like it! I'm going to make it next week, haven't had it in so long!